Companies are procuring more renewable electricity in pursuit of cost savings, market opportunities, and climate goals. They are looking to invest in countries with clear regulatory environments, as well as bold targets and policies that give them the confidence to increase their investments in renewable power. They are looking for policies that accelerate development of renewable electricity resources and make it easy for companies to structure power purchase agreements (PPAs). Companies are looking for predictability within the policy environment as well as flexibility in determining location, supplier, type of resource, and other terms. Source: KREDL (projects marked as commissioned as of July 2018). Karnataka Renewable Energy Development Ltd. (KREDL), “Solar Abstract List,” http://kredlinfo.in/solarlistrpt.aspx, accessed August 16, 2018. Based on discussion with Deepak Sriram Krishnan and Ashok Kumar Thanikonda; it is assumed that open access projects in Karnataka commissioned between 2014 and March 2018 were driven or influenced by the positive economic conditions created by the order. In 2014, India set a bold target to develop 100 GW of solar capacity by 2022. In support of that goal, the state of Karnataka set its own target to develop 2 GW of additional solar generation by 2021. However, certain charges on solar generation contributed to variability in solar prices and resulted in less competitive prices. This made solar less attractive to businesses than traditional electricity generation. The Green Power Market Development Group, a coalition of Indian and international companies working together to purchase renewable electricity, asked regulators provide clarity on the timeline of charge exemptions for solar projects in Karnataka. Following stakeholder feedback, regulators in Karnataka created 10-year exemption periods for charges on solar projects commissioned before March 2018. 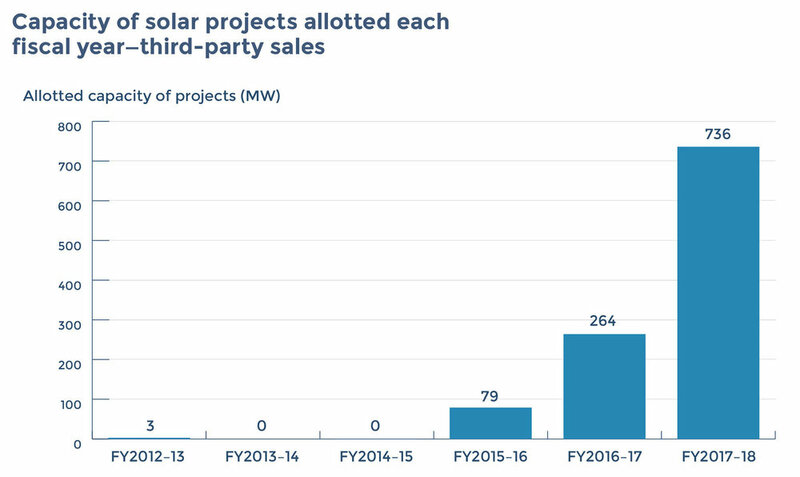 The clarity and confidence provided by the 10-year exemption and the increasingly competitive prices it created played an important role in helping to add over 1000 MW of solar capacity through third-party sales over the following four years. Today, having spurred a big uptick in third-party sales, regulators are re-assessing the policy on fees and charges, considering competitiveness of third party sales and impacts on customers’ utility rates. In addition to deciding charges for future renewable power projects, they have even considered retroactively adding charges to existing projects, which is being challenged by companies in the courts - highlighting the importance of both regulatory certainty for the viability of projects and of equitable energy rate. Source: Bloomberg New Energy Finance, “2H 2018 Corporate Energy Market Outlook,” August 2018. Notes: Data is through July 2018. Onsite PPAs not included. APAC number is an estimate. Pre–market reform Mexico PPAs are not included. These figures are subject to change and may be updated as more information is made available. Many European Union (EU) countries have long been leaders on climate change. Many have set specific goals for expanding renewable electricity to diversify energy portfolios and address air pollution. 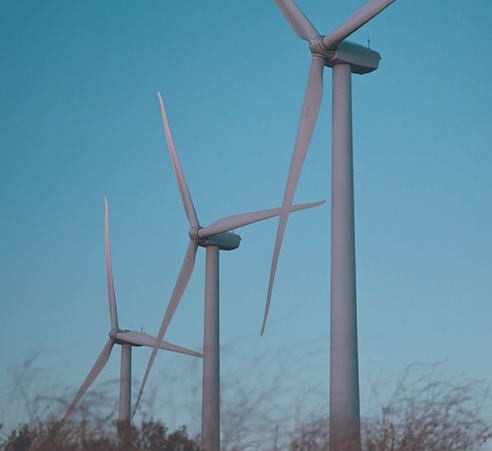 Over the years, several companies have formed alliances to help buy electricity from clean and renewable sources to achieve their climate goals. More than 70 European companies such as Unilever, a global consumer goods company; IKEA Group, a global home and furniture retailer; and BT, a British telecommunications company, have committed to power their businesses with 100 percent renewable electricity through the global RE100 initiative, led by The Climate Group in partnership with CDP. These companies have supported action in individual European countries, including policies to accelerate renewable energy markets in Poland, and have put forward joint declarations to push policymakers to increase renewable energy generation targets. Parliament, Council, and Commission reached a provisional agreement on the post-2020 Renewable Energy Directive, which includes a requirement for European countries to remove existing administrative barriers to corporate PPAs. Clearer rules for PPAs and a bolder renewable energy target at the EU level are expected to help reinforce corporate buyers’ ability to access and accelerate markets for renewable electricity in the years ahead.